There is something delicious about carstone at the best of times, that crisp gingerbread stone carved out of the cliffs not far from here. The tile and brick details on this pretty little church right in the centre of the town add something extra, and make this building wholly delightful. It was built as a congregational church, and opened in 1870. The memorial stone was laid by one of those ubiquitous Norfolk congregationalists, the Colmans of Norwich. The forty year old Jeremiah James Colman was reaching the height of his power and influence by 1870. The following year he became MP for Norwich, and was able to champion non-conformism not only here in Norfolk but in the corridors of power at Westminster. This is, I think, an important building in the history of Norfolk non-conformism. In layout, the church is like a smaller version of the nearby Methodist church, but that did not go up until a quarter of a century later. The architect here was probably the builder, a Mr Beeton. Given the early date, the exquisite tiling on the walls is surprisingly Art Nouveau in style, and the glass also appears to be so, although I couldn't see inside to confirm this: unlike Anglican and Catholic churches, non-conformist churches have no liturgical reason to be open outside of service times. But this must surely be one of the earliest examples of the Art Nouveau style in Norfolk. I would have liked to have seen inside for another reason: there is a curiously ecclesiological apse at one end, and I wondered if worship was actually carried out towards it. This arrangement is common in non-conformist churches of a couple of decades later, but it would be an early example here. 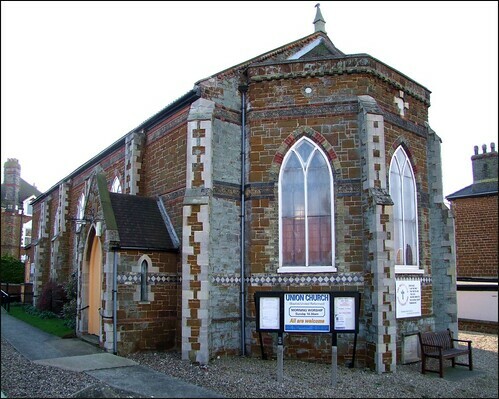 The Hunstanton Congregationalists joined the new United Reformed Church when it was formed in the early 1970s, and then some time later a group of local Baptists moved in with them, a not unusual occurence. Today, they worship as the Union Church, and I'm sure they're proud of their lovely little building.